R is a great choice for manipulating, cleaning, summarizing, producing probability statistics, and so on. In addition, it's not going away anytime soon, it is platform independent, so what you create will run almost anywhere, and it has awesome help resources. This tutorial is an excerpt from the book, Statistics for Data Science written by James D. Miller and published by Packt Publishing. R is a language and environment that is easy to learn, very flexible in nature, and very focused on statistical computing, making it a great choice for manipulating, cleaning, summarizing, producing probability statistics, and so on. R has awesome help resources--just Google it, you'll see! 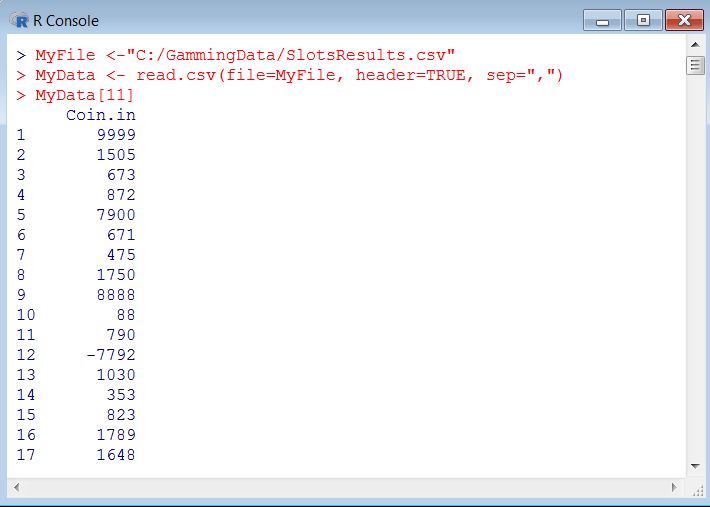 Editor’s Note: While the author has named the example data as ‘Gamming Data’, it is simply the gaming data that he uses to demonstrate his code. Let's look at a real-world example of using R to identify and then address data outliers. In the world of gaming, slot machines (a gambling machine operated by inserting coins into a slot and pulling a handle which determines the payoff) are quite popular. Most slot machines today are electronic and therefore are programmed in such a way that all their activities are continuously tracked. 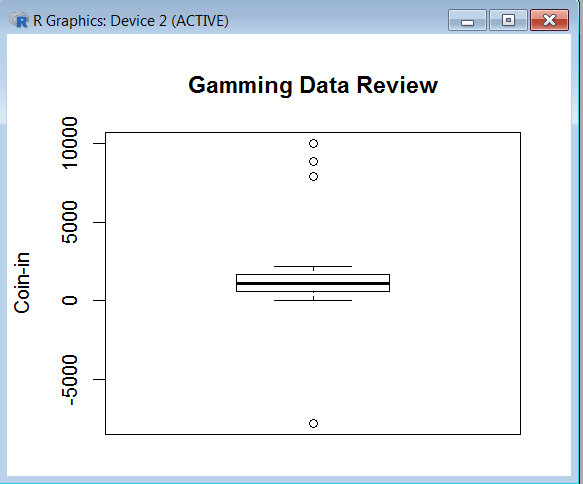 In our example, investors in a casino want to use this data (as well as various supplementary data) to drive adjustments to their profitability strategy. In other words, what makes for a profitable slot machine? Is it the machine's theme or its type? Are newer machines more profitable than older or retro machines? What about the physical location of the machine? Are lower denomination machines more profitable? We try to find our answers using the outliers. 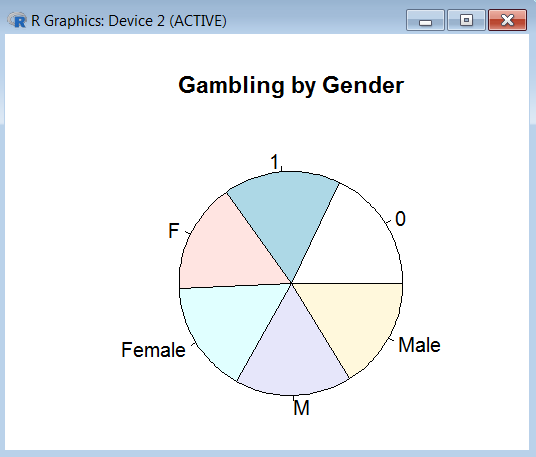 We are given a collection or pool of gaming data (formatted as a comma-delimited or CSV text file), which includes data points such as the location of the slot machine, its denomination, month, day, year, machine type, age of the machine, promotions, coupons, weather, and coin-in (which is the total amount inserted into the machine less pay-outs). The first step for us as a data scientist is to review (sometimes called profile) the data, where we'll determine if any outliers exist. The second step will be to address those outliers. Coin-in is the 11th column in our file so I am referring to it explicitly as a parameter of the function boxplot. I've also added optional parameters (again, continuing the effort to stay minimal) which add headings to the visualization. Now that we see the outliers do exist within our data, we can address them so that they do not adversely affect our intended study. Firstly, we know that it is illogical to have a negative Coin-in value since machines cannot dispense more coins that have been inserted in them. 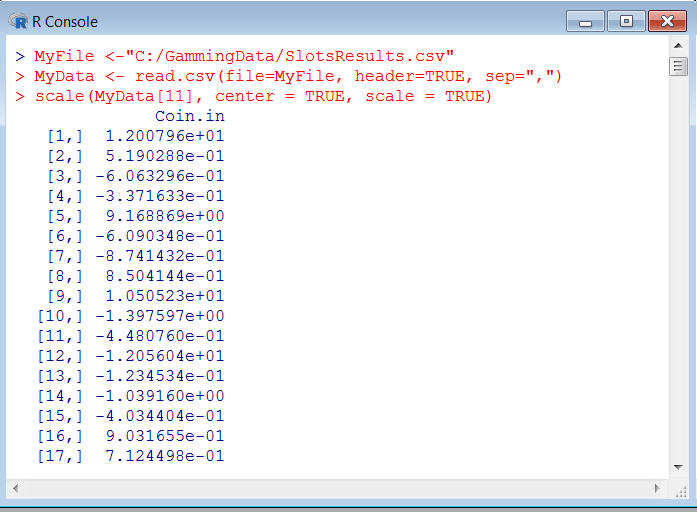 Given this rule, we can simply drop any records from the file that have negative Coin-in values. Again, R makes it easy as we'll use the subset function to create a new version of our data.frame, one that only has records (or cases) with non-negative Coin-in values. Most data scientists adopt a common naming convention to be used through the project (if not for all the projects). The names of your files should be as explicit as possible to save you time later. In addition, especially when working with big data, you need to be mindful of disk space. Moving on, another data cleaning technique is referred to as cleaning data based upon domain expertise. This doesn't need to be complicated. The point of this technique is simply using information not found in the data. For example, previously we excluded cases with negative Coin-in values since we know it is impossible to have a negative Coin-in amount. Another example might be the time when Hurricane Sandy hit the northeast United States. During that period of time, the cases of most machines had very low (if not zero) Coin-in amounts. A data scientist would probably remove all the data cases during a specific time period, based on that information. Cross-validation is is a technique where a data scientist applies rules to data in a data pool. Validity checking is the most common form of statistical data cleansing and is a process that both the data developer and the data scientist will most likely be (at least somewhat) familiar with. There can be any number of validity rules used to clean the data, and these rules will depend upon the intended purpose or objective of the data scientist. Examples of these rules include: data-typing (for example, a field must be a numeric), range limitations (where numbers or dates must fall within a certain range), required (a value cannot be empty or missing), uniqueness (a field, or a combination of fields, must be unique within the data pool), set-member (this is when values must be a member of a discreet list), foreign-key (certain values found within a case must be defined as member of or meeting a particular rule), regular expression patterning (which simply means verifying that a value is formatted in a prescribed format), and cross-field validation (where combinations of fields within a case must meet a certain criteria). One point: using this simple approach, should any value be unable to be converted, it will be set to an NA value. In type conversion, the real work is understanding what type a value needs to be, and, of course, what data types are valid; R has a wide variety of data types, including scalars, vectors (numerical, character, logical), matrices, data frames, and lists. Another area of data cleaning we'll look at here is the process of regular expression patterning. In practice, especially when working with data that is collected (or mined) from multiple sources, the data scientist surely encounters either field that are not in the desired format (for the objective at hand) or, field values that are inconsistently formatted (which potentially can yield incorrect results). Some examples can be dates, social security numbers, and telephone numbers. With dates, depending on the source, you may have to re-type (as described previously), but more often than not, you'll also need to reformat the values into a format that is usable, given your objective. Re-typing a date is important so that R knows to use the value as an actual date and you can use the various R data functions correctly. A common example is when data contains cases with dates that are perhaps formatted as YYYY/MM/DD and you want to perform a time series analysis showing a sum week to week, or some other operation that requires using the date value but perhaps requiring the date to be reformatted, or you just need it to be a true R date object type. 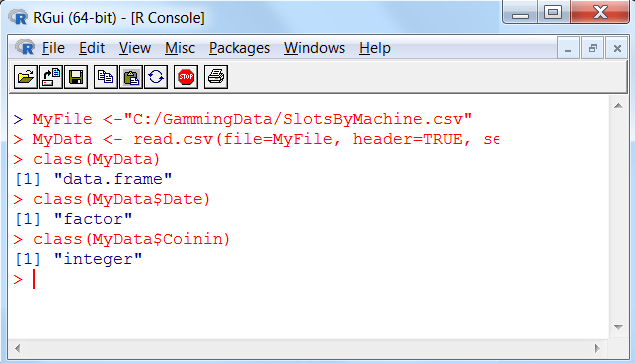 So, let's assume a new Gamming file—this one with just two columns of data: Date and Coinin. 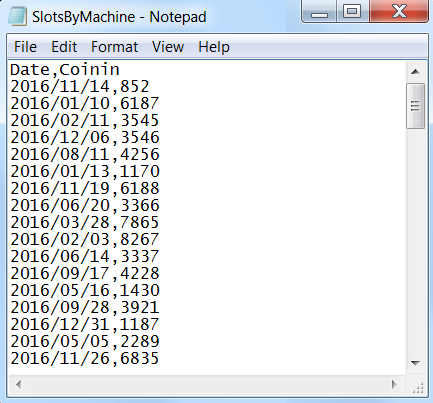 This file is a dump of collected Coinin values for a single slot machine, day by day. You can see in the preceding screenshot that we used class to display our data types. With a little trial and error, you can reformat a string or character data point exactly how you want it. Data cleaning through enhancement is another common technique where data is made complete (and perhaps more valuable) by adding related information, facts, and/or figures. The source of this additional data could be calculations using information already in the data or added from another source. There are a variety of reasons why a data scientist may take the time to enhance data. As a data scientist, you should always use scripting to enhance your data, as this approach is much better than editing a data file directly since it is less prone to errors and maintains the integrity of the original file. Also, creating scripts allows you to reapply the enhancements to multiple files and/or new versions of files received, without having to redo the same work. 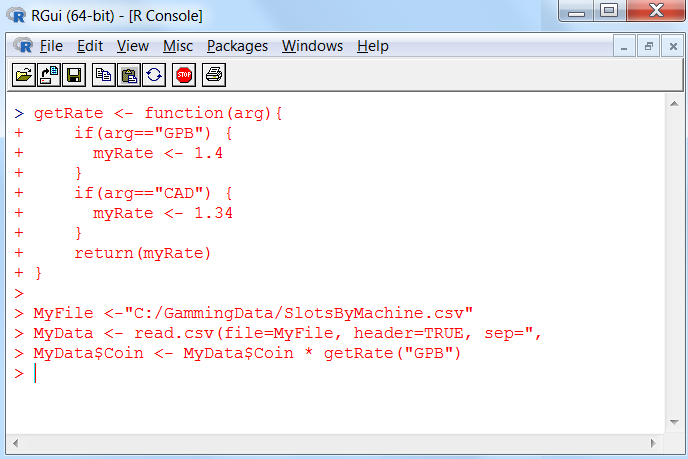 Of course, in the best of all worlds, we might modify the function to look up the rate in a table or a file, based upon the country code, so that the rates can be changed to reflect the most current value and to de-couple the data from the program code. With data harmonization, the data scientist converts, translates, or maps data values to other more desirable values, based upon the overall objective or purpose of the analysis to be performed. The most common examples of this can be gender or country code. 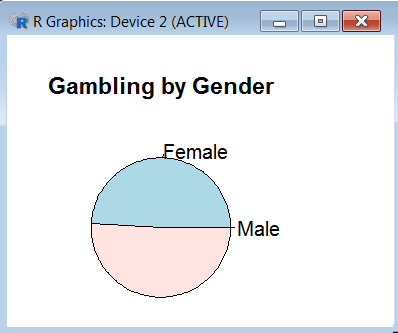 For example, if your file has gender coded as 1s and 0s or M and F, you might want to convert the data points to be consistently coded as MALE or FEMALE. This time, I've added the toupper function so that we don't have to worry about the case, as well as substr to handle values that are longer than a single character. I am assuming the argument value will be either 0,1,m,M,f,F,Male, or Female, otherwise an error will occur. Most mainstream data scientists have noted the importance of standardizing data variables (changing reference data to a standard) as part of the data cleaning process before beginning a statistical study or analysis project. This is important, as, without standardization, the data points measured using different scales will most likely not contribute equally to the analysis. If you consider that a data point within a range between 0 and 100 will outweigh a variable within a range between 0 and 1, you can understand the importance of data standardization. Using these variables without standardization in effect gives the variable with the larger range a larger weight in the analysis. To address this concern and equalize the variables, the data scientists try to transform the data into a comparable scale. Centring (of the data points) is the most common example of data standardization (there are many others though). To center a data point, the data scientist would subtract the mean of all the data points from each individual data point in the file. 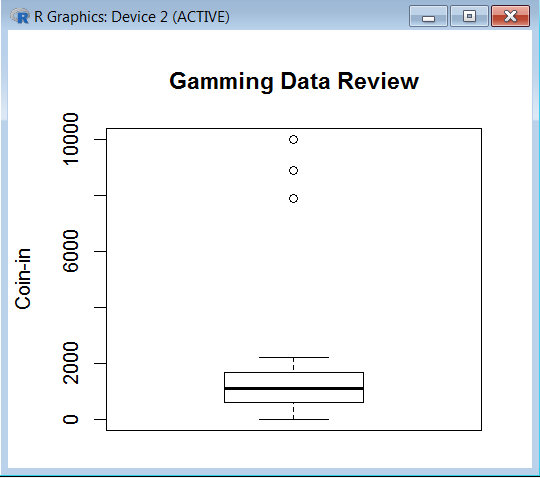 Instead of doing the mathematics, R provides the scale function. This is a function whose default method centers and/or scales a column of numeric data in a file in one line of code. Let's look at a simple example. The value of center determines how column centring is to be performed. Using center is TRUE causes centring to be done by subtracting the column means (omitting NAs) of Coin.in from their corresponding columns. The value of scale determines how column scaling is performed (after centring). If the scale is TRUE, then scaling is done by dividing the (centered) columns of Coin.in by their standard deviations if a center is TRUE, and the root mean square otherwise. You enjoyed an excerpt from the book, Statistics for Data Science written by James D. Miller and published by Packt Publishing. Use the code ORKDNA09 at checkout to get recommended eBook retail price for $9 only until June 30, 2018.